I’ve always told my children they were born perfect. I believe we are all perfect in the eyes of our creator. And together, we have a unique opportunity to make the world a better place. No matter our gender, skin color, disability, ability, sexual orientation, culture – we are all perfect. I celebrate(d) everything my children have accomplished. And to this day, I remain their biggest fan. I make no apologies as all their accomplishments are icing on a perfect cake. And then, everything we are involved in from early learning at home, television, magazines, parents, school, sports, social media, doctors (yes doctors) tell us how imperfect we are. And suddenly, we are not perfect enough. We spend our lives trying to be better, prettier, thinner, stronger, smarter, more popular all while chipping away at the perfect form in which we were born. Not everyone who wants to perform well or achieve excellence is a perfectionist. Many are satisfied with their effort and find satisfaction in their life and relationships. They lead productive lives and through their love and acceptance of self, and they can wholly and joyfully love others. I remember as a young adult going to a doctor who noted on my chart while in my clear view that I was ‘obese’ at 140 Ilbs 5’4”. Wow. I was devastated and felt like a failure because someone with medical credentials judged me and I believed him. I allowed him to influence how I felt about myself. Not okay. 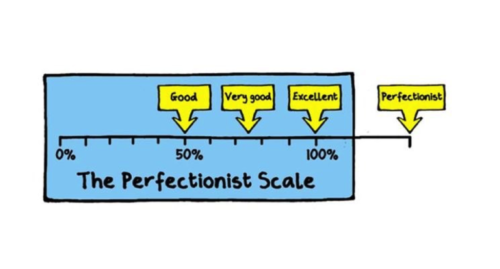 I have had moments of perfectionism and I try and keep it in check. But I’ve also seen how perfectionism can lead or be a symptom of destructive behaviors and illnesses like eating disorders. This requires help and it’s okay to ask for help. Also note that being competitive doesn’t make you a perfectionist. For a perfectionist, winning is not enough…it’s never enough. When I was a marathon assistant coach and mentor for Team in Training, I used to ask new recruits and first-time marathoners, “what do you call the person who graduates last in their medical school class….doctor!” I added that no matter where you finish in the race, you are still a marathoner and you are still accomplishing something than less than ½ of 1 percent of the world has ever even tried to do. I wanted them to shed their fear and preconceived notions of marathons/marathoning. Find an inner voice/narrative that results in your happiness. Find an inner voice of gratitude for the basic gifts in life. Find an inner voice that is louder and stronger than the external voices that tell you that you are not enough. You were born perfect. Great job of putting this issue into perspective! I know Savannah would love these words and wisdom you have shared. All my love to you!